Get the money you need for the home improvement project you want. Thanks to HFS's experienced team of experts, they can help you finance any exterior or interior home improvement project. HFS specialize in securing home improvement loans for projects such as sunrooms, kitchens, patios, basement finishing and more. With their knowledge and experience in home improvement financing, the team at HFS financial is the perfect partner. All loans funded upfront Who is eligible for a loan through HFS? Your home improvement loan is waiting! *Annual Percentage Rate (APR) refers to the cost of your credit as a yearly rate. APRs, loan amounts, and loan availability may vary by state and lender. Loan offers are subject to loan approval. Monday - Friday, 9am - 5pm est. 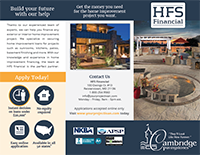 DISCLAIMER: Cambridge Pavers, Inc. is not affiliated, associated, or in any way officially connected with HFS Financial or any of its subsidiaries or its affiliates. HFS is an independent entity. Cambridge Pavers, Inc. provides HFS information only as a service to its customers. Cambridge Pavers, does not assume any responsibility.